The final stage in the performance management cycle involves determining how the employee performed, whether there were things that could have been done differently or better, and whether the employee achieved his/her learning goals for the cycle. While the supervisor is clearly responsible for conducting the final review, the process should be collaborative, with employees coming prepared to review their accomplishments, where they may have exceeded or performed to the standards required, as well as where there were challenges or shortfalls in their performance. If progress review meetings have been conducted on a regular basis, there should be few surprises for the employee and supervisor. One of the main challenges in Performance Management, especially in situations where high stakes decisions are being made based on Performance Reviews (e.g., salary increase, bonuses, promotions, etc. ), is ensuring that to the extent possible ratings of performance are as fair and as accurate as possible. The following table highlights some of the common errors when rating employee performance as well as ways in which each of these types of errors can be addressed. • Record performance information throughout the cycle. • Conduct evaluation based on full performance information available. • Substantiate evaluation, based on specific performance examples collected throughout the cycle. • Second level review by manager’s manager. • Committee reviews to rationalize ratings among employees. The tendency to give an average rating to all or most employees. • Keep a good record of performance information. • Ensuring that manager substantiates ratings based on specific performance examples. • Committee review to rationalize ratings among employees. Reliance on first impression of employee. Could be related to infrequent contact with employee. • Observing employee’s performance at work. • Regular meetings to review progress and provided feedback. Giving more favorable evaluations to employees that seem similar to manager. • Substantiate evaluation, based on specific performance examples collected throughout cycle. When designing an integrated goals and competency-based performance management system, there are a number of decisions that have to be made with regard to how the ratings will be completed. Will each goal be rated, or will the manager assign and overall rating for all goals? Will there be an arithmetic average of all the goals, or will some goals be seen as more important and given more weighting in the overall rating? Will an overall rating be given to each competency? Will each indicator be rated and then averaged to achieve a rating for the competency? Will some competencies be seen as more important and therefore be given a heavier emphasis or weighting? How will the ratings for the goals be considered in combination with the ratings for competencies? What weighting will each receive? All of these questions needed to be considered, especially if significant decisions are being made based on the ratings – e.g., pay-for-performance, bonus or other rewards, promotion, succession, etc. In the next in our series of 10 blogs, we will discuss multi-source (360 degree) feedback and the important role competencies play in this form of performance management. Sign up to our blog’s mailing list through the form on the right-hand side to receive the rest of the series in your inbox. HRSG is a leader in competency-based performance management solutions and training. Contact us today to find out how we can help you. I am just starting reading through your series and very much like what you are saying. As an advisor promoting performance management as you lay it out, my biggest challenge has been getting supervisors to fully understand and actively engage in performance management. Even with coaching and provision of helpful materials, the quality of engagement is uneven and inconsistent which undermines the whole program. What solutions have worked for you in this regard? Intensive supervisor training? Simply making sure to hire and promote people with already existing performance management aptitudes? Or something else? Unfortunately, regardless of whether you are implementing competencies as part of your program, performance management can be challenging for supervisors, especially when dealing with performance that needs improvement. First of all, supervisors need training in providing feedback to make it is useful and constructive for employees. You could also train employees to use the feedback from the appraisal process to manage their own careers making it a shared responsibility. Secondly, competencies help in the process by providing specific measurable behavioural or performance indicators to reference in providing feedback. It makes it easier for supervisors to point to the behaviours expected from employees, and likewise employees have a better appreciation of exactly the kind of performance that is expected from them. So, rather than saying to employees something like “I want you to display more initiative”, “initiative” is described in behavioral terms; for example, I want you to “.. try different options and approaches to resolve customer problems; for example, you could …”. This approach in combination with hands-on training involving role-playing, can significantly improve supervisors’ skills in providing feedback to employees. This creates an environment in which performance information is viewed as a resource that managers can use to develop their employees. Lastly involving the supervisors in the design, development and administration of the performance appraisal system can also create buy in and ownership. 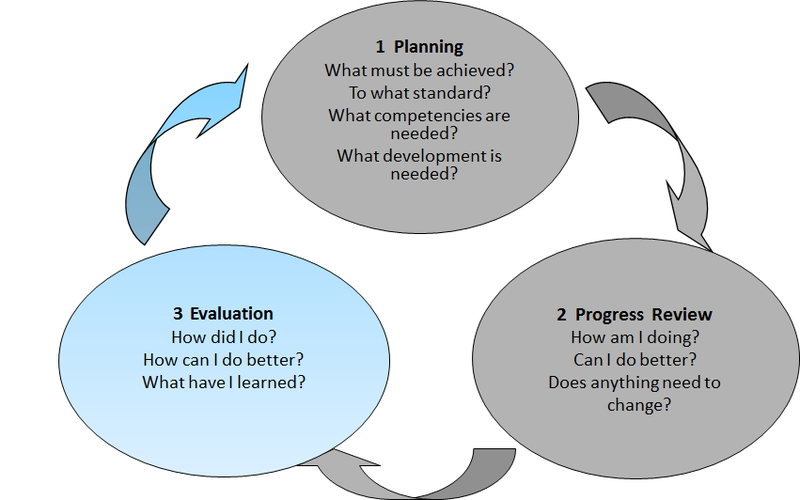 Following your performance management flow graph your queries like,how did i do?how can I do it better? are answerable.Many of the time the situation may arise within the organization when the time invested is not equal to time worked. In such cases how companies could help themselves could be understood by the following information. This may help the entire Work management cycle.